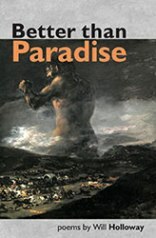 Better than Paradise by Will Holloway is an eclectic, substantial and well-crafted collection, with a range of subjects from evolution to Christianity, the plight of refugees, the model of science and mathematics and the occasional sentimental poem about human existence. Holloway leaps from the highs of some exquisite pieces to the lows of some rather obscure and confusing poems, due to his overreaching and verbose use of language. Nevertheless there is much to enjoy and appreciate in this first collection. The book is made up of three sections: Embryo Concepts; Democratic Ventriloquism and World Maps (Folded) and there are thirty five poems in all. I will critically examine a selection of poems from each section to indicate both the virtuoso skill of the poet and also his occasional failings where meaning is lost behind a canopy of words. Then he uses the examples of nuclear weapons, and the refugee crisis to make the same point. He sums this attitude up succinctly and with a genuinely unique phrase, calling it: “adultery amongst the intelligentsia.” I found this poem both informative and original. and the shiatsu job and the clients. in a huge, white, featureless desert. It was the worst thing that had ever happened. but it had the best view. The relaxed and humorous tone of the piece mixed with the seriousness nature of the situation are dextrously expressed and make for a substantial and engaging poem. The last piece in this first section is “Gulls” which reveals the day to day activities of life, as the author states in the first line, “The world is a great palace / of beaches, souvenirs and mini-golf.” Other observations in this piece include: “The lightswitch is full of light./ The airport is full of air,” and he continues, “so space must be full of warm breezes/on which moths fly, hypnotised,/ to the moth-coloured Moon.” – an alluring image indeed! The final thoughts include ”We do harmless ordinary things” and “Gulls yap between the planets.” The poem is full of such vitality, figurative language and quirky observations. In the second section “The Fall of the Crown” lists Kings in what seems to be in no apparent historical order and ends with “King Barack/King Donald” which is obviously a reference to Donald Trump. However, for me, this piece lacks any useful context and seems to have no poetic purpose other than being a “list”. In my opinion, it is one of the weaker poems in this collection. Nevertheless, the author returns to poetic form with some of the final poems of section two. The first being “Our Chairman” which I don’t think is based on any historical fact, but rather on the poet’s lively imagination. The piece claims that: “It’s little known fact that/ before the Long march came the Long Tour” and that “before his gruelling conquest of China/ Mao Zedong endured an equally gruelling/stint on the Northern club circuit” and consequently “it was there that he first honed down/ the collection of one-liners/later to become famous as the ‘Thoughts’.” This piece serves its purpose with distinction, making fun of Mao Zedong , and almost ridiculing his place in history. thoughts are imitations of talking. For me, these are just random statements verging on the obscure and so any sense of value that the reader can get from the poem is lost in this “cascade of words”. Also “The Missing Term” contains mathematical equations, which I think are beyond the grasp of the average reader and so again one cannot appreciate the poetic purpose of the author, when some of the poems drift into such specialised territory. but is stronger than a train. which cannot be seen among the leaves. but fangs do not frighten the gnat. I find this kind of work ingenious and the author writes high quality pieces when he shapes his words into concise poetic forms rather than the “cascades of words” which are verbose and at times without definite meaning. Overall, Better the Paradise is a vibrant and incisive first collection with a sweeping range of subject matter. It’s only let-down is when the author becomes embroiled in lengthy, and verbose material, which seems to overreach itself and leaves the reader in a minefield of obscurity. Nevertheless, the more I read the collection, the more I enjoyed it and I look forward to Will Holloway’s future work.